A HEALTHY AND NATURALLY GLUTEN FREE DINNER (OR LUNCH) THAT IS FULL OF FLAVOR AND PACKED WITH NUTRIENTS! I usually am not crazy about sauteed greens, as in I REALLY do NOT like sauteed greens. BUT as soon as I took a bite of this amazing sauteed meal I was in love. This recipe is a new favorite that I will make on a weekly basis now and the fact that it was so simple to throw together makes it even better! 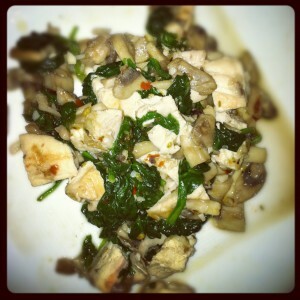 *I Paired Chicken with this dish, but remember this can be served as a vegetarian meal with any other proteins.